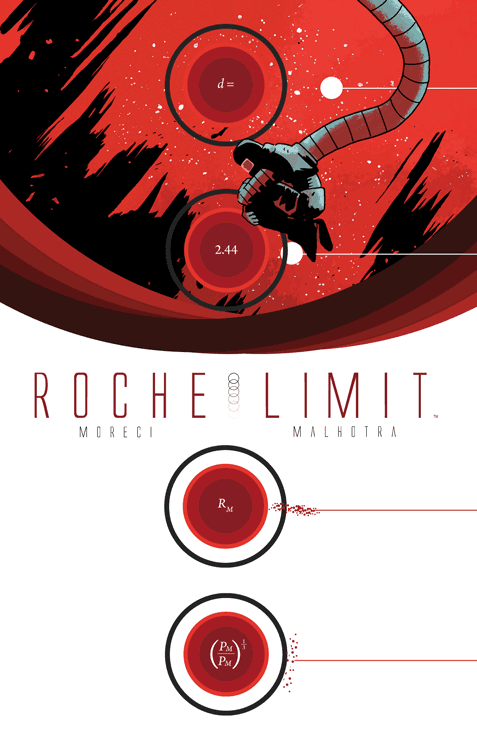 In this collected volume (issues 1-5) of Roche Limit from Michael Moreci and artist Vic Malhotra the illusion isn't one of trickery or falsehoods it is an indictment of our own human arrogance that we ignore the truth and clear a path for our own destruction. Moreci would like you to believe Roche Limit is about a likeable drug maker named Alex Ford and earth cop Sonya Torin searching for her missing sister Bekkah. The two navigate the seedy world that has become the dwarf planet Dispater in hopes of uncovering her whereabouts. This noirish element to the story is exciting and dangerous. Alex has the recipe to a drug known as 'recall' that has every lowlife, including a psychopath named Moscow, out to get it from him. Yet, it's their love for Bekkah that has them turning over ever leaf to find her. If the story ended there you'd have a decent tale all on its own. However, there's more to the series than this frantic search. Every chapter opens with a monologue from the founder of the Roche Limit Colony, billionaire Langford Skaarsgred. He commissioned the exploration that landed the discovery of Dispater and as it has devolved into the same kind of world they left behind. Its proximity to an energy anomaly has altered life on Dispater and will continue to with disastrous consequences. Skaarsgred contemplates how things might have been different or where it all went wrong. He provides a cautionary tale full of good intentions and as we all know where that road leads to. It's these long narratives of thoughts and admissions that the soul of Roche Limit exists. Sure, the grounded story of a lost loved one amid the collapse of law and decency is captivating on its own but how did we get here? What amount of hubris made us believe we could make this work or expect any different than civilizations before us? The answer is we are doomed to repeat our failures when blinded by ambition and greed. Greed of knowledge, of money, of fame, of knowing more that we are capable of comprehending. And that is why the Roche Limit was set-up to fail from the beginning. Roche represents a microcosm of the history of man. A time of great discovery, appropriation, struggle, triumph, exploitation, wealth, corruption, decay and death. When mining for renewable energy only brought the components for a new drug, investors and prosperous stakeholders abandoned the colony so it could fend for itself. Leaving in its wake was a raw unwashed wound that festered with parasites willing to exploit what was left for their own gain. This was not the utopia Skaarsgred had hoped. His gateway to beyond the anomaly became a way station for those lost and for those who wanted to stay lost. Skaarsgred represents a humbled god, reminiscing the birth of a nation, the flight of dreams now wilted into an anomaly itself. This "black sun" as Moscow calls it, is the bane of their existence, a death knell full of energy and power that was best left alone. Whatever hope and optimism Skaarsgred had it has waned and leaves his recorded transmissions to be found for "someone" to heed his warning. It all becomes a mixture of spirituality, science, and pragmatism. As if all forms of intellect and logic have been applied to understand the situation created by man. This philosophy lesson disguised as a comic book would mean little were it not illustrated with such conviction and artistry by Vic Malhotra. Moreci's expansive imagination and world building is captured perfectly through the pencils of the artist. Roche Limit demands multiple locales, different interior lighting designs the vastness of space and the anomaly itself. With the great colors of Jordyn Boyd and Lauren Affe, Dispater comes alive in muted tones mostly, hidden in shadows and light, with occasional bursts of oranges and reds. The colony itself a canvas of science fiction noir caught between Blade Runner and Dark City. Malhotra crafts some wonderful layouts, setting scenes that control the pace without rushing, revealing ever so carefully the impending action. He becomes as much a storyteller as the writer. Moreci shines in exposition, his thoughts funneled through Skaarsgred's final recording and waxing poetic about the drive against all odds to create a better world. A world soiled and corrupted but nonetheless the optimism carries on if not for us then perhaps the next generation. It is a worthy battle cry to make a difference and change the world. But how do you accomplish that without letting the world change you? Roche Limit Volume 1 is a smartly written story that invokes more than just thrills but challenges the reader to think. It challenges your beliefs and questions your humanity. Not very many comic books can do that. None have done it better. How far will you go to fulfill your passion? And at what cost?